Most autochromes do seem to have the authority of art – that power to rivet our gaze and demand of our eyes that they return again and again, and the power to reward those returns with pleasure and insight. It would be interesting to know what it is about the autochrome that so compels, to know why that soft glow of suggestion, of elegant ladies in lace, of nuance and the Monet-haze of dream is so emotionally gripping, so psychologically arresting. Alfonse Van Besten, Symphony in white, 1912 autochrome 9 x 12cm. Around 1890 a number of amateur photographers were dissatisfied with the mere technical merits of photography. They wished to use photography for reproducing beauty and expressing their inner feelings and thoughts. Their vision had been opposed by painters and art critics, who were of the opinion that photography, being the product of a technical device, did not belong in a museum. The invention of a “fuzzy rendering process”, and the introduction of the manipulated image moved photography closer to the contemporary art movements in painting. Previous objections, to allow photography into the holy sanctuaries of museums, gradually disappeared. In 1895 the Koninklijke Musea voor Kunst en Geschiedenis in Brussels started collecting international art photography. Among the foremost Belgian pictorialists from around 1900 were Hector Collard, Alexandre, Edmond Sacré, Gustave Marissiaux, Léonard Misonne and Edouard Hannon. Like genuine impressionists they were captivated by light, atmosphere and colour. ( From the exposition catalogue “De fotografie in België 1839 – 1940” at the Provinciaal Museum voor Kunstambachten, Deurne, 1970). It was not until 1907 that colour photography, thanks to the autochrome process, came within the reach of photographers. But from among the above mentioned Belgian photographers, it was only Gustave Marissiaux who fully started to make use of the new technique. Whether his fellow pictorialists have ever applied the autochrome process is uncertain: were they disappointed by the fact that the new technique, in contrast to other known photographic techniques, was impossible to manipulate? For most of us it is quite a surprise to realise that even before the first world war photographing in colour was possible. This was due to the autochrome process invented during the years 1895-1903, by the French brothers Louis Lumière (1864-1947 and Auguste Lumière (1862-1954). It took them four further years to work out and refine the several fabrication processes. 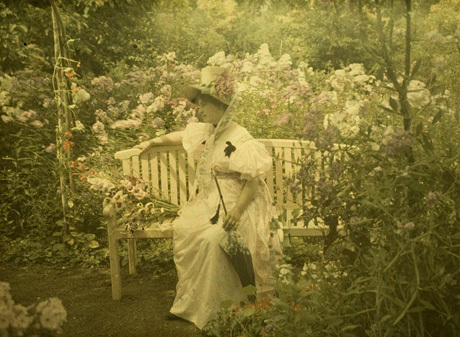 Finally in 1907 the autochrome plates came on the market and were an instant succes. Until now, the photographers’ only way to produce colour was tinting the plates by hand which was done by many photographers with breathtaking artistry. 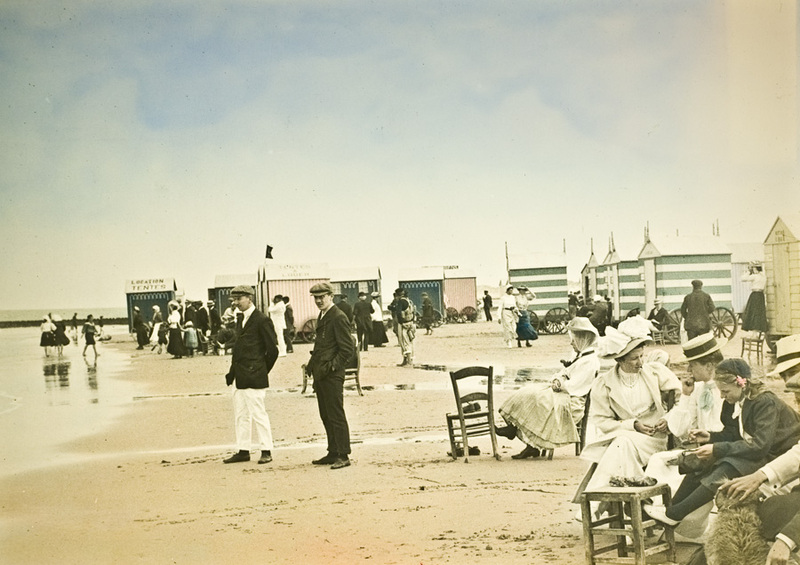 E.g.the beach scene below is a hand coloured example of a plate coloured by the Belgian amateur photographer Constant Casters, who had a very refined hand and taste. The nucleus of autochrome plates are dyed grains of potatoe starch measuring between 0,006-0,025mm. Make a mix of these three different coloured grain starches. You need a glassplate between 0,9 and 1,8mm thick. Blow the coloured mix of grains on the varnished plate. The whole plate then has to be pressed to reduce overall thinkness of layers. After pressing apply a second layer of varnish. There are between 6000 to 7000 grains on a square millimeter. A rolling pressure of 5000kg per square centimetre had to be achieved to press the layers without breaking the fragile glass plate. Around 1914 the daily outlet was 6000 autochrome plates. The biggest collection of autochromes (72.000 plates) is housed at the Albert Kahn Museum at Boulogne Billancourt/France. to view a note on the photographer and his autochromes.